We all love a lush, green lawn but unless you want to be forever out there on some maintenance task, they are best kept to a minimum. A healthy lawn requires a lot of input – both in terms of time and money – and, if you are the one who does all the whipper-snipping and mowing – like me – you will sympathize and be nodding your head in agreement. I also want to put the small garden that I have to its most effective use – to maximize its potential with food and flower plants – not just grass. I want beauty and birds and basil AND tomatoes. 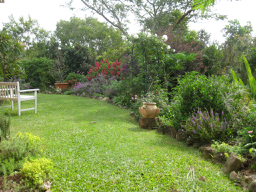 However, lawns have a valuable place in any garden design – for access, play, tea time and, just simply, for a peaceful, cool green expanse that links the garden spaces. So with spring on the way, it’s time to tend the lawn so it’s ready for a burst of warm-weather growth. Now here’s the thing – a healthy and vigorously growing lawn looks better, has less weeds and is easier to maintain. AERATION. Every lawn will benefit from aerating the soil surface. This has a multi-beneficial effect including; alleviating compaction – continual traffic causes the grass to die, increasing water penetration and providing more air spaces for roots to grow more strongly. Increased grass growth means less weeds. If you have a large area you can hire an aerator. You just fill it with water and push it around. It’s easy and cheap. I don’t have a large lawn area and just use a garden fork and stab it into the grass as I’m walking around OR invite the grandkids over for an al fresco dance party and give them each a pair of stilettos. Then TOP DRESS WITH A soil mix . 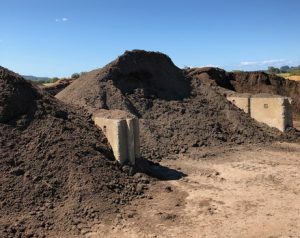 In very uneven areas where you want to create a level lawn – think peaks and troughs, Snowy Mountains – it is best to fill the gaps with a mix of ORGANIC MATTER/SOIL/WASHED RIVER SAND in roughly equal proportions. Our local landscape supplier has such a mix. It is often referred to as ‘under turf mix’ and often has an all-purpose fertilizer added to it. See photo below. In mostly even areas of lawn that are level, where the grass is actively growing, TOP DRESS with washed RIVER SAND to a depth of about 50mm-1cm. This helps to improve drainage and encourage spring growth of lawns that are laid on clay soils – like ours. 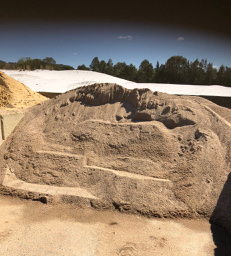 Fine sand does not work as well as the coarser river sand. See photo below. FERTILIZE. I use a granular, organic, complete plant food like Organic Life at the rate of one handful per square metre over the whole lawn and water in well. That’s it. Your lawn maintenance schedule for the year! MATTING AND THATCHING – this is where the grass has consistently been cut too high creating a deep, spongy lawn – TOO DEEP. Why is this undesirable? Because the stems of grass closest to the soil are denied light, will not be actively growing and will begin to die-off, eventually causing dead brown patches in the lawn. PLUS lawns like this are perfect snake havens! 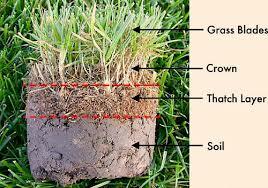 The SOLUTION is to DROP THE CUTTING PLATE OF THE MOWER right down and cut off the THATCH layer to just above the soil. The whole area will temporarily look BROWN. Next you need to AERATE and TOP DRESS and water well. It is time to fertilize when it turns green again – WAIT UNTIL THEN or you will burn the baby grass shoots. DEAD AREAS. Patches of dead grass are usually caused by one of two things SHADE or FOOT TRAFFIC. SHADE. The Solution. If it is a small area AERATE, TOP DRESS and oversew with SHADE TOLERANT GRASS SEED. 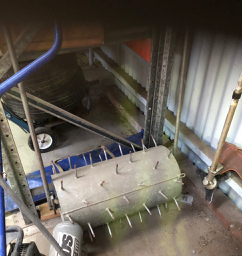 Water well until seed has germinated and KEEP THE BIRDS OFF – good luck! If it is a large area – AERATE, TOP DRESS and buy some ROLLS OF SHADE TOLERANT TURF GRASS to replace the bare areas. Water well until grass is established. DEEP SHADE. Don’t try and persist with grass. 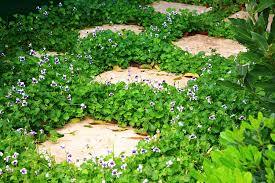 Put some pavers down and plant around with native violet viola hederaceae OR mondo grass. Both will take light traffic and mowing. HIGH TRAFFIC AREAS: Resulting in large dead patches of lawn. The only solution for this situation above is to completely replace WITH TURF. AERATE first – because it will be compacted. THEN put down a layer of soil (see the UNDER TURF MIX above). For smaller areas you can prepare the surface and oversew with seed – see the notes for SHADE above. GYPSUM is not called Clay Breaker for nothing. It’s a good idea, at this point, to apply some at a rate of a handful per square metre to break up the clay before you lay seed or turf – it’s called flocculation!! 3. WHICH GRASS? The most common warm climate grasses are COUCH and NARROW LEAF BUFFALO. This is a swings and roundabouts decision. BUFFALO provides a denser, lower maintenance lawn but it is not that great for kids to play on – the cut leaf blades can cause scratching and irritation – which is why I prefer COUCH. COUCH will also tolerate some shade. They are both running grasses and will easily patch up small areas of dead lawn if you regularly AERATE/TOP-DRESS and FERTILIZE. 4. MOWING? This is the most useful advice I am going to give you. DON’T CUT THE GRASS TOO HIGH and DON’T CUT IT TOO SHORT. If you cut it too high, you will end up with MATTING AND THATCHING with resulting dead areas of lawn. If you cut it too low the lawn will not grow dense enough to prevent WEED INVASION. The ideal height for warm season grasses is about 2cm in the cooler months and 1cm in the summer. 5. WEEDS. Get to them before they flower and seed! I am not going to tell you to reach for HERBICIDES – I never use any If you think they are safe for you and our planet then I will just say that they thought smoking and DDT was too. WHAT DO I DO? Well, my main problems are bindis and broad-leaf weeds in areas of high traffic on my lawn. 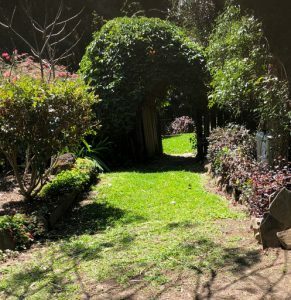 We often go away for a a few months at a time and keeping up the regular maintenance jobs in the garden – like lawn care – just doesn’t happen and I pay the price, literally. 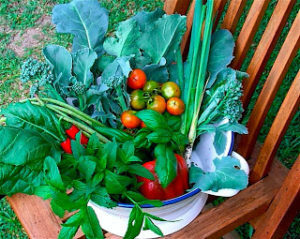 At the end of winter I give the grandchildren an old dinner fork and a bucket and pay them 1cent per weed to dig them out – mercenary but effective – especially with seven of them at it. They like to run around barefoot and hate those ouchy bindis in their feet. If more than 40% of your lawn is weed – then I would be starting again with re-turfing. 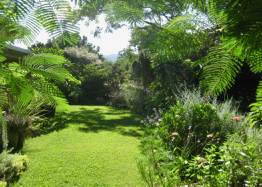 TOP TIP: Here is Jerry Coleby-Williams (ABC Gardening Australia) recipe for weed control in lawns – good for bindis, clover, cudweed, plantain and dandelions. It is one handed down from his grandfather and, while still chemical, it is less toxic than commercial herbicides. Wear gloves and in a bucket mix up 1 cup washed river sand with 1 cup sulphate of potash and 1 cup of iron sulphate. Mix together and carefully sprinkle directly onto weed area. Water in. Exclude pets and children until it has been absorbed into the soil. Use straight away because it will turn into a rock hard brick! 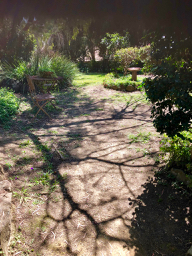 My lawn after some spring renovation.